Although most people do not speak of theater and Iran in the same breath, dramatic expression has always been a fixture of Iranian culture. Some 2500 years ago, kings and commoners alike were regaled by comic theater in the form of dance and mime, accompanied by music. The dancers often wore masks, a vestige of an earlier era when such dances were enacted as religious rites. Comic drama also took a slapstick form, in which social situations were lampooned and people ridiculed by imitating their accents and behavior. Yet another ancient dramatic art was that of puppets, known to exist much earlier than its attested date of about 1000 CE. Only glove and string puppets were popular in Iran; shadow puppetry failed to win a following. Like comic dance and mime, narrative drama originated in religious rites. Secularization of these rites produced an epic tradition that was very popular in pre-Islamic Iran. The bard had an important place in social life, and the verbal art of poetry, storytelling, elegy and recitation thrived, often accompanied by music. In Islamic times, this art form was given impetus by elegies and public recitations about the heroic deeds of ancient kings. In addition, Iran produced the only form of Islamic religious epic drama (ta`ziyeh-khvani), which dealt with the martyrdom of Imam Hoseyn. In traditional Iranian theater, there was no real difference between high and low culture, although artists attached to the royal court and sponsored by the rich tended to be more competent than those who performed for the public at large. With the exception of religious and narrative drama, written texts were seldom used. The artists—whether comedian, mime, puppeteer, elegist or storyteller performed both in public and private spaces. The arrival of European theater, with its reliance on a written text and normative rather than improvisatory acting, was part of the modernization process in Iran. European theater was introduced to the country in 1878, enjoyed a hey-day in the early years of the twentieth century, and has experienced many ups-and-downs since then. Today, it once again enjoys great popularity. At the same time, traditional theatre is being rediscovered, and playwrights are using some of its forms to develop indigenous modern Iranian theatre—a melding of the deep past and dynamic present. Dramatic performance has existed in Iran throughout history, although some Iranian and Western scholars say differently. Drama in Iran is generally thought to be of recent date and of European origin. It is further believed that the devel-opment of formal theatrical institutions is of an even more recent date. Religious Islamic opposition against frivolous entertainment of any kind in general, and the impersonation of living beings in particular, is sometimes cited as an expla-nation for the slow development of theatrical drama in Iran and elsewhere. This certainly was the case, but as will be clear from the discussion in this book, de-spite opposition and warnings from conservative Moslems it never stopped dra-matic artists from performing and from Moslems enjoying their performances. 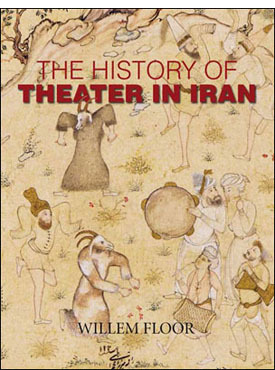 Although Western¬-style drama was indeed introduced in Iran in the nineteenth century, this did not mean that indigenous dramatic art did not exist in Iran prior to the nineteenth century; it was, however, not necessarily of the kind that West-erners identify as theater, as much of Iran’s dramatic art took the form of folk theater. Not much is known about the manifestations of these early art forms, but I discuss what is known about them and how they grew into art forms that are more recognizable to the modern reader as dramatic art. Many people may not necessarily recognize these early art forms as theatrical per-formance, because most people in the twenty-first century have been divorced from their ancient cultural roots and have no or little inkling that dramatic per-formances usually were not staged in a theater. It also depends, of course, how you define drama. Therefore I state upfront what I mean by the term ‘drama’ when I use it in this study. Drama is the writing, acting, or producing of a por-trayal of life characters or the telling of a story, usually involving conflicts and emotions exhibited through action and dialogue. In short, it is an art form, usually in dialogue, that centers on the actions of characters. Taking this as my starting point means that drama is not necessarily only a written text that is performed by actors in a building often specifically built for that purpose. The definition explic-itly includes minstrels, mimes, dancers, story-tellers, in fact anyone acting out the action of characters in song, spoken words, or gesture. Iran is unique in that within its borders the only form of Islamic religious drama (ta`ziyeh-khvani) came into being. What is characteristic for traditional Iranian drama is that with the exception of religious and narrative drama written texts were seldom used. Dramatic art in Iran was strong on improvisation emphasizing the limited role that written text played. The difference between high and low cul-ture was a rather artificial one; all traditional forms of Iranian dramatic art were expressions of popular culture. Those artists who were attached to the royal court and sponsored by the rich were just better and more competent than their less for-tunate colleagues, who performed for the public at large. Theater was initially of a ritual nature, a dramatization of man’s relationship with nature, the gods, and other human beings. Theater was born out of sacred rites performed by priests and lay actors dramatizing myths and legends at fixed times and often in fixed locations. As such the dialogues of the Avesta (ca. 1000 BCE) may be considered as a source for, if not a form of, this ritual religious drama as may ta`ziyeh-khvani or Shi`ite religious tragedy. Folk theater—mime, puppetry, farce, juggling—also had a ritual context in that it was performed at religious and/or social high days such as days of naming, circumcisions, and marriages. Often these plays were seasonal due to the agricultural calendar that made peas-ants ‘available’ as an audience and as actors only at certain times of the year. Over time some of these contextual ritual enactments became divorced from their religious meaning and they were performed throughout the year. However, until this day many of these dramatized rites are still performed at the times and for the (watered-down) purposes for which they originally had come into being. For example, Georg Goyan has argued that Armenian theater grew out of the fu-neral rites for the gods Anahita-Gisane, the Armenian counterpart of the contem-porary Ishtar-Tammuz and the Anahita-Ahura Mazda cult in the Iranian Empire and other parts of the Middle East. The Armenian god Gisane was the son of the Mother Goddess Turan. Like the other gods, Gisane also had an astronomical symbol that represented his divinity in the celestial firmament. In his case it was a comet that appeared and disappeared on the horizon, symbolizing the god’s death and resurrection. Because of the tail of the comet and its form it was called the “hairy star” and the meaning of Gisane in Armenian literally is “the long haired one.” The priests or ministrants of Gisane were called gusans; they let their hair grow long in honor of their god. This hair was then combed high to resemble the tail of the comet. To achieve this effect the priests supported their hair with a cone-shaped gisakal, which over time developed into the onkos triangles such as worn in ancient Greek tragic theater. This is the origin of the onkos and the cone-shaped hats worn by the actors in antiquity. As stated above, the cult of Anahita-Gisane had its parallels elsewhere in the Middle-East and Eurasia: the funerary rites of, for example, Adonis with the god’s resurrection and his return into the arms of Decreta Aphrodite had its counterpart in Armenia. The resurrection of Gisane was also accompanied by bacchanals dedicated to celebrate nature’s fertil-ity in which the priestesses of the Armenian goddess of fertility (Anahita) played a prominent role. These priestesses were known as vartzak, about whom later. Over time, the funerary rites for the god were also enacted for his human descen-dants, the semi-divine Armenian kings, and later for the Armenian nobility as a kind of ancestor worship. Like in the case of the rites for Gisane, the funerary rites for the Armenain kings and nobility also were performed by the dzainarku-gusans or the gusan-voghbergaks, singing mourners and wailers, who sang the praises of the deceased and his family. They rhapsodized the “immortal” heroic deeds of the deceased and thus the gusans were initially bards and minstrels and the ceremonial was not yet a play. Gradually, to more vividly portray the heroic deeds of the deceased, mimicry and dance were added to singing lamentation, which resulted in a presentation on stage and in the transformation of gusans into actors. Moses of Khorene mentioned that Armenians honored the memory of their departed kings with songs, pageantry and dancing. According to Goyan, this prac-tice evoked that of Roman funeral rites where masked actor-dancers represented the deceased with motions and gestures mimicking those of the deceased while singing the praise of his life. Because it was difficult for one actor-dancer to enact the life of the deceased one or more were added and thus tragic theater came into being. Similarly comic Armenian theater developed out of the spring rites related to the Gisane cult, celebrating fertility and the return of life. Aristotle also opined that comedy originated with “the conceivers of phallic songs.” The revelry and the comic-singing (kataker-gutiun) in connection with the Gisane rites were indeed fertility rites in which both gusans (the Gisane priests) and the vartzaks (priest-esses of Anahita) participated. For a long time it was comic theater rather than tragic theater that dominated life in Armenia. Thus, both tragic and comic Armenian theater originated in the funerary and res-urrection rites of Gisane-Ara. The funerary rites were characterized by lamenta-tion and wailing called voghbergutiun or song of lamentation in ancient Armenian. The resurrection rites that were characterized by laughter, banter and wild rejoicing were called katakergutiun, literally jesting or joyous singing. The modern Armenian word for tragic theater is voghbergutiun just like the old Arme-nian word for actor (vartzak) is a reminder of the original religious role of the ac-tor-dancer as the word vartzak is derived from the word vartz, meaning a bundle of young budding twigs tied with a ribbon, which symbolized spring and was an emblem of the resurrected god. Finally, the gusans, who originally were minis-trants of Gisane, over time turned into bards and mimes; thus along with the terms vartzak and voghbergutiun, clearly establishing the link between funerary rites and theater.